A small speaker from the company whose name has been synonymous with computer audio for decades. This speaker packs a punch, but is it worth the price tag? Incredible sound with quick NFC pairing and easy standard controls. A host of additional controls for unneeded and half-hearted features makes the speaker appear more complex than it truly is. This is a small but powerful speaker that packs a much larger punch than its size would convey. Definitely a product to consider if you are in the market for a portable Bluetooth speaker. Creative Labs has always been synonymous with sound quality. 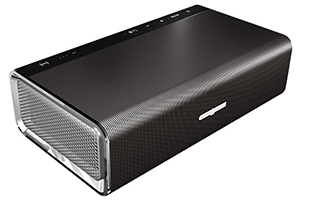 Their Sound Blaster family of products, of which this speaker is a member, has been THE name in computer audio since personal computers became popular. Their NOMAD and Zen MP3 players helped start the portable audio revolution. The ROAR follows in the grand tradition of Creative quality audio products, producing incredible sound in a very small package. How they manage to fit a 5-driver array capable of producing sound this loud, this clear with the ability to add as much bass as this speaker can produce is beyond me. The standard audio is perfect for normal music listening, video steaming and phone calls alike. With the addition of the ROAR feature, which is a bass boost, the speaker has the ability to fill a room with no problem, or add that extra thump if that is your style. The speaker sports NFC pairing, which makes configuring it for any modern phone, and some tablets, incredibly easy. Unfortunately, since not all manufacturers offer phones with modern hardware, it means manual configuration for those devices. Luckily, the manual pairing process is fairly easy, with just the long-press of a button to enter pairing mode, even if another device is actively connected. The phone was able to connect to the speaker immediately via NFC. The phone remained connected through an entire episode streamed on Netflix without any signal drops. The iPhone, being a few generations old, running the current release of iOS, took almost 30 seconds to connect via manual process. This speed was replicated more than once. The player remained connected through an entire episode streamed on Netflix without any signal drops. The tablet, running the most modern version of Windows and sporting current hardware, connected immediately via manual process from the settings charm. The tablet remained connected through several episodes streamed on Netflix without any signal drops. The tablet, running an older, abandoned operating system, sporting older hardware, connected immediately using the manual process. The tablet remained connected through an entire album played from internal memory (webOS 3.0 does not have a Netflix application, nor Xbox Music support). The album played without and signal drops. The capabilities of this speaker are just about what you would expect for a device that does not claim any special range capabilities. I was unable to take the speaker form one end of my 3 bedroom apartment to the other without losing connectivity, but was able to keep a clear connection 2 rooms away. I was also not able to make it outside and still play music through exterior walls or glass. The overall range of the speaker, however, does not detract much from the intended purpose of the product, but it would have been nice to be able to move the speaker into the kitchen while streaming music from the computer. To test the battery life of this product, we decided to test both with a practical and official process. This allows us to see how the speaker functions under controlled and real-world scenarios. For me, the best way to test out a Bluetooth speaker in the real world is to run it in my office while I work. Often, while I write, I listen to music. Of course, this means I paired my phone, the HTC 8Xt mentioned in the Connectivity section, and streamed Xbox Music all day. The wonderful thing was, the battery lasted all day. While I program, however, I tend to watch (or listen to) Hulu or Netflix, while binging on a series. For this, I decided to pair my Microsoft Surface Pro with the speaker and continuously play video. Again, the battery was able to keep up with me, lasting longer on a charge than myself. Running our battery test against this speaker averaged just above 9 hours on a full charge. This is definitely more than enough juice to last through almost any event that you would have where power would be an issue. The results also corroborated our practical test's results, running longer than an average work day. While you wouldn't expect a device designed for music to have exceptional call quality, you will be surprised to find that the ROAR has exceptional call quality. Tested on several phones from various manufacturers running different operating systems, the result was always the same: the sound quality on both ends of the call was top-notch. On the speaker end, the speaker seems to use the entire 5-driver array, meaning you have the ability to really pump up the volume and sound quality. Even in normal volume, though, the sound is perfectly understandable. On the microphone side, the person on the other side of the call is able to hear everything clearly and distinctly. On a test call, the receiving person was unable to tell the difference between using the ROAR and speaking directly into the phone. In addition to solo testing, we took this speaker out for a spin with a conference call. The speaker was loud enough for everyone involved in the call to hear clearly and the receiving end was able to hear everyone at the table clearly as well. The overall control scheme for the speaker system itself is very straight-forward. There is a power button, a "ROAR" button, which is the sound boost feature, a volume up button, a volume down button and a call/pairing button. The power button is fairly self-explanatory: hold it down to turn the speaker on or off. The volume buttons also do exactly as you would expect. The ROAR button turns on and off the unique feature of this speaker: the sound boost (more about that in Sound Quality). The other button is a little less predictable, but still easy to use. While paired with a phone, or any device with a Bluetooth command set, pressing the button will trigger that command. On a Windows Phone 8.1 device, for example, it will trigger Cortana. Long-pressing the button will put the speaker into pairing mode, which will allow you to pair a device that does not have NFC (more about that in Connectivity). In addition to the button on the top, there is also an NFC logo, which is indicated by (((nfc))). If your device is NFC enabled, like all modern phones in the last few years, and the feature is enabled, you can simply place your device on this logo and pair immediately. This prevents the annoying process of going into pairing mode, searching for the speaker on the device and sometimes entering a pairing code. Almost all of our devices were NFC-enabled, so we were capable of pairing without any real work. On the back of the speaker is where it gets a little weird. There are a lot of controls here for features that are really unnecessary on a device like this. There is a panic alarm and voice recorder, plus a whole system for playing media internally. With play/pause, back, forward and shuffle/repeat options, plus a microSD slot for media, there is some potential for a stand-alone media player, but the device has no screen. With no screen, playing media from internal memory is almost completely useless. It's possible that using this to play music at a picnic or similar event with no particular plan for music would be successful, but that scenario is so uncommon that half-heartedly including this feature was not required. Two of the features included, which are also on the back, which I really appreciate are the auxiliary input and USB charger. The ability for this speaker to be able to charge your phone while it is playing via Bluetooth makes this significantly more useful, especially during an outing. The noise cancelation on the speaker is impressive, but not perfect. The speaker was able to isolate both its own audio and background noises, though some background noises made it through. What was most impressive was its ability to isolate its own audio so well, preventing and feedback to the other caller. There is a split pairing of learning curve for using this speaker. The primary controls, found on the top of the speaker, are easy to use and completely natural. If only these controls existed, this would be a perfect 5, easy to use speaker. Unfortunately, with the addition of the controls on the back for features that are not required, the overall ease of use and ability to pick up the speaker and know how to use it is lost. Controlling media playback is almost impossible because of the lack of a screen to display what is playing, what is coming and what exactly is happening. The alarm controls are odd, appearing to have 2 separate ways to turn on or off the alarm, neither of them exactly accomplishing the goal as expected.